A biography of Abraham Lincoln’s indispensable but controversial Secretary of War, Edwin Stanton, the man the president entrusted with raising the army that preserved the Union. ...this fresh tome (nearly 700 pages with notes and bibliography) is far more than a rebuttal to Stanton critics, past and present. What Stahr has harvested here from notes, letters and memoirs reveals the man who could behave as Stanton did on that night and in many other controversial moments ... Stahr shows us Stanton confronting that [asassination] crisis as he had so many others, with specific orders, definite plans and ferocious energy ... Moving swiftly across the enormous landscape of Stanton's life and times, Stahr provides a narrative that is both readily accessible and compelling for scholars long familiar with the basic facts. Stahr finds in even the more ephemeral material insights into the ways Stanton stood out from his cohort while embodying the virtues and limitations of his times. Although not a superlative stylist, Stahr is a steady, even-keel narrator who navigates each controversy with clarity and care. The author audits Stanton’s wartime record meticulously, criticizing his indifference to civil liberties and his often fraught relationships with field commanders and fellow Cabinet officers. But he spends too little time dealing with reports that Stanton behaved in a cowardly manner when the CSS Virginia attacked the Union fleet at Hampton Roads, Va. ... And Mr. Stahr might have explored the stubborn myth that Stanton was complicit in Lincoln’s assassination—a discredited canard, to be sure, but one that many Lincoln scholars, this writer included, still hear from lay readers ... This exhaustively researched, well-paced book should take its place as the new, standard biography of the ill-tempered man who helped save the Union: It is fair, judicious, authoritative and comprehensive. It is not, however, a literary triumph. Mr. Stahr’s narrative, though well-paced, is straightforward, unadorned and sometimes didactic. Much like Edwin M. Stanton. ...a judiciously sympathetic treatment that tries to calm a still-uncalmable subject ... Stahr admits that his subject was 'duplicitous and even deceitful,' but argues that he was 'a great man' if not a good one. He was almost certainly indispensable in the preservation of a system that has since allowed us to be freely led by a long succession of good and great and awful and, finally, absurd men. 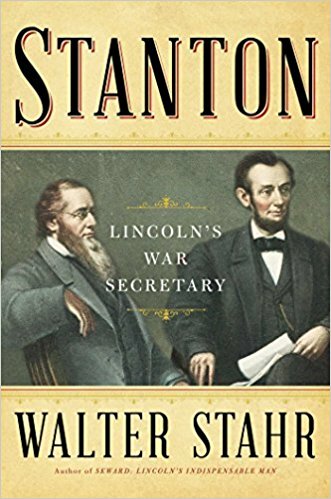 What did you think of Stanton: Lincoln’s War Secretary?